Shares of the high-end retailer dropped on a surprise charge in its third-quarter earnings report. Shares of Nordstrom (NYSE:JWN) tumbled last month, after the department-store chain posted underwhelming results in its third-quarter earnings report. Its third-quarter profit was much lower than expected because of a one-time error related to its credit card business. As a result, the stock finished November down 20%, according to data from S&P Global Market Intelligence. 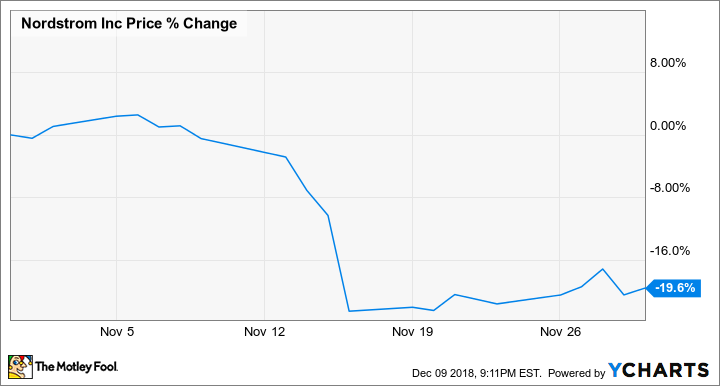 The stock started slipping when Macy's shares fell on its earnings report two days before Nordstrom's came out, and then plunged on Nordstrom's results on Nov. 16. Aside from the credit card charge, Nordstrom's results were solid. Revenue increased 3% to $3.75 billion, topping estimates at $3.69 billion. Revenue would have increased 4%, adjusting for the timing of its annual anniversary sale. Comparable sales were up 2.3%, increasing 5.8% in the off-price channel and 0.4% in the full-price segment, though full-price comps would have been higher, accounting for the shift in the anniversary sale. Over the second and third quarters, they rose 2.5%. Digital sales increased 20% and made up 26% of net sales in the quarter and 30% year to date. The company took a $72 million charge in the quarter after it discovered that some delinquent Nordstrom credit card accounts were being incorrectly charged a higher interest rate. Including that charge, the company reported earnings per share of $0.39, compared with EPS of $0.67 a year ago and expectations of $0.66. Adjusting for the charge, EPS would have been flat at $0.67. Co-President Blake Nordstrom said, "Our early investments in our digital capabilities are paying off. The combination of our digital capabilities and local market assets have enabled us to be at the forefront of serving customers on their terms." Looking ahead, management raised its full-year guidance slightly, calling for total net sales of $15.5 billion to $15.6 billion, up from a previous range of $15.4 billion to $15.5 billion. It also sees comparable sales of 2%, up from a range of 1.5%-2%, and raised the bottom end of its adjusted EPS guidance from $3.50-$3.65 to a range of $3.55-$3.65. Aside from the credit card change, Nordstrom's results left little to quibble with, and the company seems on track for a strong holiday, considering the momentum in the retail industry and high consumer confidence levels. Considering the credit card was a one-time charge, now may be a good time to take advantage of the sell-off, as Nordstrom has outperformed many of its brick-and-mortar peers.